Laptop Rolling Cart in Cherry and Black Finish 40'' H x 25'' W x 16'' D in. Laptop Rolling Cart in Cherry and Black Finish 40'' H x 25'' W x 16'' D in. by FamisCorp at Momiji Studios. MPN: 5010c. Hurry! Limited time offer. Offer valid only while supplies last. Features: -Premium collection. -Finish: cherry. -Adjustable. -Rolling. -Tray can be both flat and tilted: yes. -Installation service approved: yes. Features: -Premium collection. -Finish: cherry. -Adjustable. -Rolling. -Tray can be both flat and tilted: yes. -Installation service approved: yes. Casters Included: -Yes. 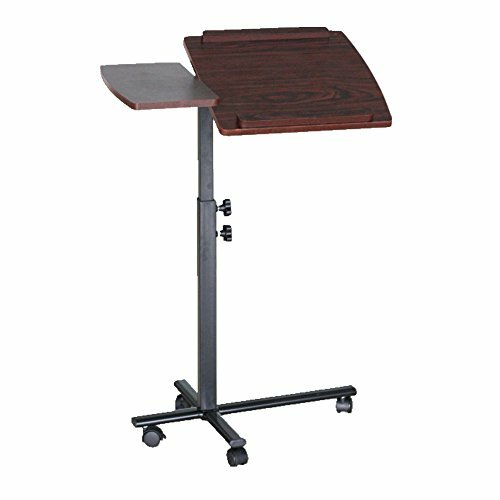 Product Type: -Laptop Cart or Stand. Finish: -Cherry. Dimensions: Overall Width - Side to Side: -25". Overall Depth - Front to Back: -16". Overall Product Weight: -15 lbs. Height Adjustable: -Yes. Overall Height - Top to Bottom: -40". Minimum Overall Height - Floor to Tabletop: -29". Maximum Overall Height - Floor to Tabletop: -40". If you have any questions about this product by FamisCorp, contact us by completing and submitting the form below. If you are looking for a specif part number, please include it with your message. Rolling Laptop Computer Cart Made of MDF and Steel in Graphite Finish 31'' H x 22'' W x 20'' D in.